An enduring myth is that Cuba in the 1950s was a socially and economically backward country whose development, especially in the areas of health and education, was made possible by the socialist nature of the Castro government. Despite the widespread acceptance of this view, readily available data show that Cuba was already a relatively well-advanced country in 1958, certainly by Latin American standards, and in some cases by world standards. The data show that Cuba has at best maintained what were already high levels of development in health and education, but that in other areas, Cubans have borne extraordinary costs as a result of Castro-style totalitarianism and misguided economic policies. Indeed, with the possible exception of health and education, Cuba’s relative position among Latin American countries is lower today than in it was in 1958 for virtually every socioeconomic measure for which reliable data are available. This paper draws a comparison between the socioeconomic development of Cuba prior to Castro’s taking power and the Cuba of today, after 40 years of revolutionary socialist government, and compares Cuba’s development in each of these periods with that of all other countries in Latin America for which data are available.2 We have relied most extensively on United Nations (UN) data, particularly from the Statistical Yearbook and Demographic Yearbook, which we consider among the most extensive data compendiums in the development field. Other trade and macroeconomic data are derived from the International Monetary Fund’s Direction of Trade Statistics, which provides a consistent data series dating back to the pre-revolutionary period. For the various international comparisons and rankings given below, only those countries acquiring independence prior to 1958 and having relatively consistent data available for the period 1955-present have been included. The former stipulation excludes many highly developed Caribbean countries from consideration. In some cases, this noticeably affects our results. For example, The Bahamas, Guyana, and Barbados all would rank ahead of Argentina and Cuba as the most literate countries in Latin America and the Caribbean, according to the UN’s latest Statistical Yearbook published in 1997 (pp. 85-86). The health care system is often touted by many observers as one of the Castro government’s greatest achievements. One Latin American head of state, for example, recently called Cuba’s health care system “spectacular,” adding that Cuba “proved the dialectic truth that revolutions produce healthy children” (Cawthorne 1998). What this and other similar analyses ignore is that the revolutionary government inherited an already advanced health sector when it took power in 1959. In the early 1950s, a World Bank-organized mission declared that for a tropical country, Cuba enjoyed “remarkable freedom from disease” (1951, p. 4). Indeed, the 25 years prior to Castro’s takeover constituted a period of rapid growth in the number of healthcare facilities on the island. A 1977 article in the Journal of the Florida Medical Association (Navarro) lists 72 large hospitals operating in Cuba in 1958—double the number that existed just 25 years earlier—with more than 21,000 beds among them. These numbers exclude municipal centers, which provided emergency clinical and surgical assistance in large cities, and the 250 privately-run medical centers, most of which were structured on a “mutual aid” basis that gave patients access to medical and surgical care for less than five pesos per month. At least a half million Cubans were enrolled in such programs as of 1958. Including governmental, municipal, and private hospitals and clinics, Cuba had about 35,000 beds for 6.6 million inhabitants—an impressive one bed per every 190 inhabitants. Cuba’s infant mortality rate of 32 per 1,000 live births in 1957 was the lowest in Latin America and the 13th lowest in the world, according to UN data. Cuba ranked ahead of France, Belgium, West Germany, Israel, Japan, Austria, Italy, Spain, and Portugal, all of which would eventually overtake Cuba in this indicator during the following decades (UN 1979, pp. 67-188). Today, Cuba remains the most advanced country in the region in this measure, but its world ranking has fallen from 13th to 25th during the Castro era, according to UN Data (1997b, pp. 93-100). Also missing from the conventional analysis of Cuba’s infant mortality rates is its staggering abortion rate—0.71 abortions per live birth in 1991, according to the latest UN data—which, because of selective termination of “high-risk” pregnancies, yields lower numbers for infant mortality. Cuba’s abortion rate is at least twice the rate for the other countries listed in Table 1 for which data are available (UN 1997a, pp. 322- 326, 369-370). In terms of physicians and dentists per capita, Cuba ranked third in Latin America in 1957, behind only Uruguay and Argentina—both of which were more advanced than the United States in this measure. Cuba’s 128 physicians and dentists per 100,000 people in 1957 placed Cuba at the same level as the Netherlands, and ahead of the United Kingdom (122 per 100,000 people) and Finland (96) (UN 1960, pp. 569-573; UN 1979, pp. 67-188). Unfortunately, the UN Statistical Yearbook no longer publishes these statistics, so more recent comparisons are not possible, but it is completely erroneous to characterize pre-revolutionary Cuba as backward in terms of healthcare. Cuba has had one of the most literate populations in Latin America since well before the Castro revolution, when its literacy rate ranked fourth in the region (UN 1957, pp. 600-602). Its relatively advanced educational system produced a highly skilled workforce. The World Bank’s Report on Cuba stated in 1951. One should not overstate pre-Castro Cuba’s reliance on imported human capital, however. Baklanoff (1975, p. 25), citing U.S. government data, shows that fewer than one-fourth of the 2,000 supervisory, professional, and technical personnel employed by U.S. subsidiaries in 1957 were sent from the United States. Since the 1950s, Cuba has increased its literacy rate from 76 to 96 percent, which today places it second only to Argentina among those 11 Latin American countries for which comparable 1950s UN data are available (UN 1957, pp. 600-602; UN 1997b, pp. 85-86).3 This improvement is impressive, but not unique, among Latin American countries. Panama— which ranked just behind Cuba in this indicator during the 1950s—has matched Cuba’s improvement when measured in percentage point terms. In fact, a review of the UN statistics below reveals that the whole hemisphere has made enormous strides in literacy over the past 40 years (see Table 2). We will show that these other countries making significant progress in this area have done so with far less degradation to other measures of human welfare than socialist Cuba has. Teaching children to read, of course, is but one aspect of primary and secondary education, albeit an important one. We suspect, however, that in other areas, Cuba’s government-run schools fall short because of the strong ideological content present in the instruction and the lack of alternatives available to parents. The Cuban government forbids religious or private schools. Pope John Paul II, during his first mass in Cuba in January, strongly criticized the Cuban state’s “substitution of the role of parents” in education. He noted that the state’s boarding schools in the countryside feed a host of social ills such as sexual promiscuity and have a “traumatic” and “profoundly negative” impact on students (Moore 1998). The Cuban people have been deprived not only of luxuries now increasingly enjoyed by the middle classes in other Latin American countries but also of basic commodities such as food. Rationing has been a feature of Cuban life since the early 1960s. During the early 1990s, the variety and amount of food consumption deteriorated sharply, when massive amounts of Soviet aid were withdrawn and food imports plummeted. On its own without Soviet largesse and abundant food imports, Cuban agriculture was paralyzed by a scarcity of inputs and poor production incentives resulting from collectivism and the lack of appropriate price signals. In pre-Castro Cuba, by contrast, food supplies were abundant, and its people were among the best fed in the hemisphere. The UN’s Statistical Yearbook, 1960 (pp. 312-316) ranked pre-revolutionary Cuba third out of 11 Latin American countries in per capita daily caloric consumption. This was in spite of the fact that the latest available food consumption data for Cuba at the time were from 1948-49, almost a decade before the other Latin American countries’ data being used in the comparison. Looking at the same group of 11 countries today (see Table 3), Cuba ranks last in per capita daily caloric consumption, according to the most recent data available from the UN Food and Agricultural Organization. 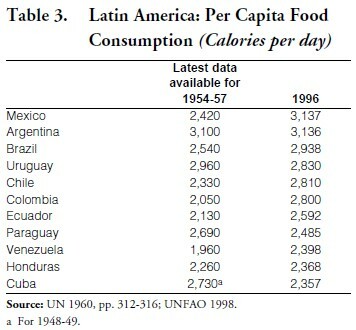 Indeed, the data show Cuba with a food situation slightly worse than that of Honduras (UNFAO 1998). A closer look at some basic food groups reveals that Cubans now have less access to cereals, tubers, and meats than they had in the late 1940s. According to the latest UN data (UNFAO 1998), Cuba’s per capita supply of cereals has fallen from 106 kg per year in the late 1940s to 103 kg today, half a century later. Per capita supply of root crops shows an even steeper decline, from 91 kg per year to 63 kg. Meat supplies have fallen from 33 kg per year to 23 kg per year, measured on a per capita basis. The Cuban leadership’s claim that the country’s food problems are due to the U.S. embargo does not hold up to scrutiny. 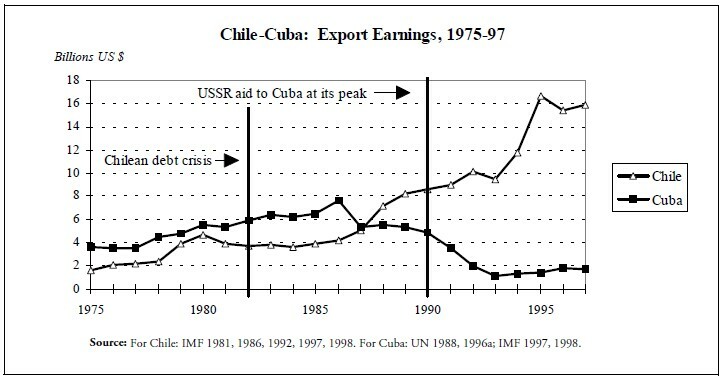 The food shortages are a function of an inefficient collectivized agricultural system and a scarcity of foreign exchange resulting from Castro’s unwillingness to liberalize Cuba’s economy, diversify its export base, and pay off debts owed to its Japanese, European, and Latin American trading partners during the years of abundant Soviet aid. This foreign exchange shortage, not the U.S. embargo, has severely limited Cuba’s ability to purchase readily-available food supplies from Canada, Latin America, and Europe. We believe that the U.S. embargo has added, at most, relatively small increases in transportation costs by forcing Cuba to import food from non-U.S. sources elsewhere in the hemisphere. The statistics on the consumption of nonfood items tell a similar story of economic deprivation. The number of automobiles in Cuba per capita has actually fallen since the 1950s, the only country in the hemisphere for which this is the case. Indeed, the latest available UN data for Cuba used in this comparison are for the late 1980s, a period when Soviet aid to Cuba was at its peak and the rest of Latin America was in the midst of the “lost decade,” a period characterized throughout the region by economic stagnation. The 1988 data on automobiles also reveal that countries in Asia and Europe that once ranked far behind Cuba in this measure have since surpassed it by a wide margin. Japan, with four cars per 1,000 inhabitants in 1958, was far behind Cuba (24 per 1,000 inhabitants) then, but by 1988, Japan’s number had grown to 251, whereas the figure for Cuba—even at the height of Soviet aid!—remained frozen at its 1958 level. Similar comments could be made for Portugal (increased from 15 in 1958 to 216 in 1988), Spain (increased from 6 to 278), and Greece (increased from 4 to 150). Indeed, Italy’s 29 cars per capita was not far ahead of Cuba’s 24 in 1958, but by 1988, Italy boasted 440 cars per capita, whereas the figure for Cuba was unchanged from the 1950s. Telephones are another case in point. While every other country in the region has seen its teledensity increase at least two fold—and most have seen even greater improvements—Cuba’s has remained frozen at 1958 levels. 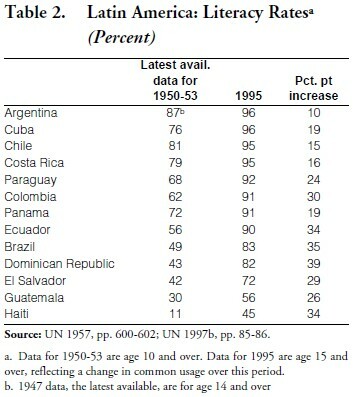 As of 1995, the latest year for which UN data are available, Cuba had only three telephone lines per 100 people, placing it 16th out of 20 Latin American countries surveyed and far behind countries that were less advanced than Cuba in this measure in 1958, such as Costa Rica (16 lines per 100 people in 1995), Argentina (16) , Chile (13), Panama (11), Venezuela (11), and several others (UN 1997b, pp. 147-149). Cuba also has not kept pace with the rest of Latin America in terms of radios per capita. During the period 1956-1958, Cuba ranked second only to Uruguay in Latin America, with 169 radios per 1,000 people (UN 1958, pp. 576-578; UN 1960, pp. 608- 609). 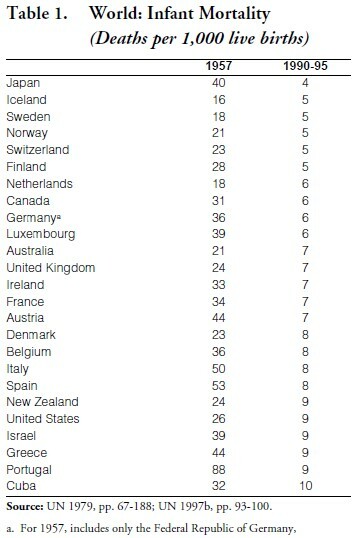 Worldwide, this put Cuba just ahead of Japan. At that time, Argentina and Cuba were very similar in terms of this measure. Since then, the number of radios per capita in Argentina has grown three times as fast as in Cuba (UN 1997b, pp. 132-134). Cuba also has been surpassed by Bolivia, Venezuela, El Salvador, Honduras, and Brazil in this indicator. Today, Cuba ranks just above average for Latin American countries. In terms of television receivers per capita, Cuba in the 1950s was far ahead of the rest of Latin America and was among the world’s leaders. Cuba had 45 television sets per 1,000 inhabitants in 1957, by far the most in Latin America and, amazingly, fifth in the world, behind only Monaco, the United States, Canada, and the United Kingdom (UN 1958, p. 580). In fact, its closest competitor in Latin America was Venezuela, which had only 16 television sets per 1,000 people. Today, Cuba has 170 television receivers per thousand, behind Uruguay (232 per capita), Argentina (219), and Brazil (209) (UN 1997b, pp. 132-134). It should be noted that of these three countries, Uruguay in 1957 had fewer than one television set per 1,000 people, and Argentina and Brazil each had only five per 1,000 people—numbers far inferior at the time to Cuba’s 45 sets per 1,000 inhabitants. Historically, the most widely cited economic development indicators are per capita national production measures. Unfortunately, due to the prevalence of exchange rate distortions and vast differences in inflation rates among Latin American countries, as well as the lack of continuity in data sources and methods, we are wary of drawing any firm conclusions from these measures alone about the relative progress or lack thereof made by Cuba in economic development during the past 40 years. However, for the sake of completeness, we venture a few comments on the indicators here. Cuba in 1958, with a per capita gross domestic product (GDP) of $370, ranked fifth out of 20 Latin American countries, according to UN estimates based on commercial exchange rate conversions (1964, p. 322).5 Cuba ranked behind only oil-rich Venezuela ($975), Argentina ($474), Uruguay ($450), and Chile ($409). In 1995, also according to the commercial exchange-rate based, per capita GDP statistics published in the national accounts database of the Statistics Division of the UN (1998a), Cuba ranked 11th. 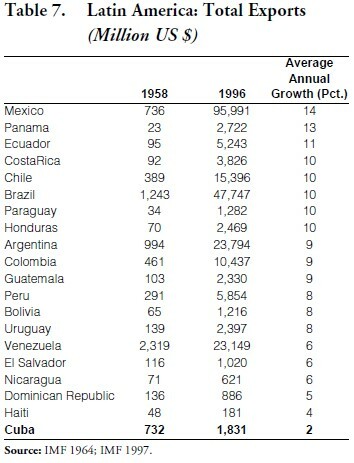 Keeping in mind the difficulties inherent in comparing per capita GDP statistics across decades and countries, it is nonetheless interesting to note that the two countries in the region suffering the greatest declines in terms of ranking among Latin American countries in this indicator are the only two countries in the region to have significantly embraced Marxism: Nicaragua fell from 11th to 19th place, and Cuba, as we have already noted, slid from fifth to 11th place. We can gain additional insight into Cuba’s economic performance today vis-à-vis 1958 by looking at specific subsectors of the national economy. The erosion of Cuba’s productivity in the sugar sector—by far its top export commodity—has been well documented elsewhere and does not require lengthy elaboration here. Suffice it to say that in 1958, Cuba ranked just ahead of the Soviet Union as the largest sugar producer in the world (UNFAO 1961, pp. 71-73). Today, it barely ranks among the top 10 producers. Indeed, Cuba is the only one among the top 25 world producers whose production of sugar today is lower than it was in 1958 (UNFAO 1997, pp. 157-58). This decline has taken place despite the fact that Cuba’s installed milling capacity today is more than 10-percent greater than it was in 1958 (Pérez-López 1991, pp. 39, 42). Cuban government officials are fond of making estimates of the “costs” of the U.S. embargo, but they carefully avoid mention of the enormous costs involved in their own neglect of tourism facilities, infrastructure, and promotion during the first three decades of revolutionary government. Only in the past 10 years have they allowed foreign investment and management in hotels and other tourism facilities on the island—and even then only under restrictive conditions. Of the six countries in Latin America and the Caribbean for which comparable 1958 and 1995 data are available (Cuba, Costa Rica, Dominican Republic, Haiti, Mexico, and Peru), Cuba ranked a comfortable second in 1958, behind only Mexico, in terms of tourist arrivals. By 1995, Cuba’s ranking had fallen to fourth, as it was surpassed by the Dominican Republic and Costa Rica (UN 1997b, pp. 797-799). When one considers that in 1958, the Dominican Republic received a mere one-fifth of the number of tourists that Cuba did, and that 37 years later tourist arrivals in the Dominican Republic were twice those received by Cuba, Cuba’s foregone opportunities in this sector of the economy become apparent. Cuba’s difficulties in the provision of basic public utilities such as water and electricity have been well documented by its own state-run media. 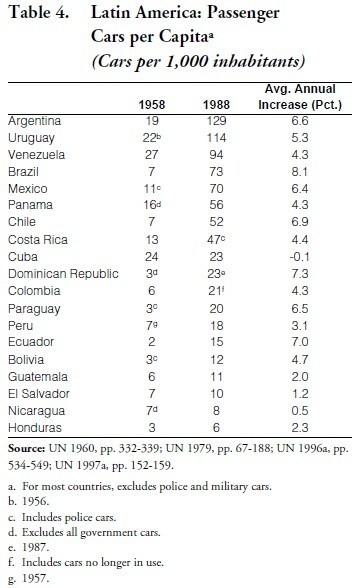 In electricity production, UN data show that Cuba’s relative ranking among 20 Latin American countries has fallen from eighth to 11th during the Castro era (UN 1960, pp. 294-296; UN 1979, pp. 67-188; UN 1997c, pp. 432-441; UN 1998b, pp. 155-156). In fact, in terms of the rate of growth for electricity production over the past 40 years, Cuba ranks 19th of 20 countries in the region, with only Haiti showing less accelerated development. Turning to agricultural production, Cuba is the only country in Latin America whose production of rice is lower today than it was four decades ago, when it ranked fourth in the region in production of this staple (UNFAO 1961, p. 50; UNFAO 1997, p. 70). Two of the countries in the region ranking ahead of Cuba in rice production in 1958—Colombia and Peru—have since seen their rice production grow by more than three-fold (see Table 5). Cuba’s Caribbean neighbor, the Dominican Republic, has increased. Perhaps even more telling are Cuba’s yields per hectare in rice production. Whereas the Dominican Republic has increased rice yields from 2,100 kg per hectare in 1958 to 5,400 kg per hectare in 1996, Cuba’s yields today are only 2,500 kg per hectare, a negligible increase from the 2,400 kg per hectare registered in 1958, according to the Food and Agriculture Organization of the United Nations. 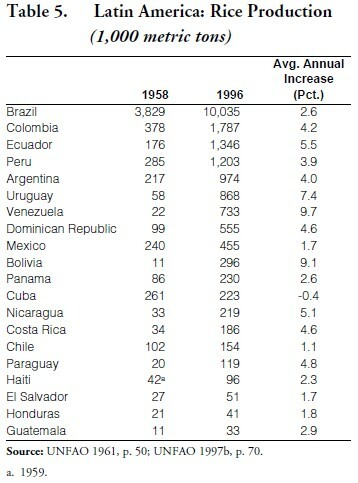 Cuba’s milk production in 1996 was only 11 percent higher than it was 38 years previously, by far the smallest increase in all of Latin America and the Caribbean (see Table 6). In 1958, Cuba ranked fifth in the region in milk production, producing 828,000 tons (UN 1966). 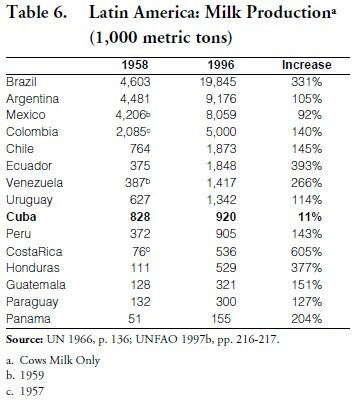 By 1996, Cuba’s position in Latin America had fallen to ninth, according to UNFAO data (1997b), as Cuban production stagnated while production in Ecuador, Venezuela, Chile, and Uruguay took off. In 1958, Cuba ranked sixth among the 17 Latin American and Caribbean countries surveyed by the United Nations in the production of cement, but by 1994, its regional ranking had fallen to 11th (UN 1997b, pp. 488-493). In the intervening years, Cuba’s production was surpassed by Peru, Chile, Ecuador, the Dominican Republic, and Guatemala. By virtually any measure, Cuba’s external accounts were in far better shape in 1958 than they are today. The economic reforms which have swept the region have literally transformed the region’s economies, resulting in massive increases in exports and foreign investment inflows. To date, Castro has refused to implement even what other Latin American leaders would regard as basic, “first generation” economic reforms. As a result, Cuba is falling further behind its neighbors with each passing year. Cuba’s exports have not kept pace with other countries of the region. Of the 20 countries in the region for which comparable IMF data are available, Cuba ranks last in terms of export growth—below even Haiti (IMF 1964, 1997). A startling fact is that Mexico and Cuba had virtually identical export levels in 1958—while Mexico’s population was five times Cuba’s. Since then, Mexico’s exports have increased by almost 130-fold, according to IMF statistics. Cuba’s export earnings, on the other hand, are merely twice as high as they were 40 years ago. Looking at other countries, one finds that Cuba’s exports in 1958 far exceeded those of Chile, Colombia, and Peru, countries which have since left Cuba behind (see Table 7). Cuba’s enviable productive base during the 1950s was strengthened by sizable inflows of foreign direct investment. Although foreign investment figures by source country during the 1950s are scarce, Cuba’s attractive foreign investment climate at that time is apparent from U.S. data. As of 1958, the value of U.S. foreign direct investment alone in Cuba was $861 million, according to U.S. government figures published in 1959 (Commerce 1959, p. 30). Adjusting for inflation, that foreign investment number amounts to more than $4.3 billion in today’s dollars. The value of U.S. foreign direct investment in Cuba as of 1958 was greater than U.S. direct investment in Mexico, Argentina, or Chile. Among European countries, only the United Kingdom received more U.S. direct investment than did Cuba, while world economic powers such as France and Germany received less. Contrary to popular perception, these U.S. investments were not limited to raw materials such as sugar. U.S. firms began to gradually sell their Cuban sugar holdings to Cuban firms beginning in 1935. By 1958, U.S. firms owned fewer than 40 of Cuba’s 161 mills (Schroeder 1982, p. 258). While U.S. firms were moving away from sugar, they were rapidly investing in a range of other ventures, especially in infrastructure development. According to U.S. government statistics (Commerce 1959, p. 30), 41 percent of US direct investments in Cuba were in utilities as of 1958. U.S. investments also were significant in manufacturing, petroleum processing, chemicals and pharmaceuticals, and food processing. In fact, during the decade of the 1950s, U.S. investments in non-sugar sectors of the economy doubled. (Franco and Ventura 1996, pp. 7, 18). 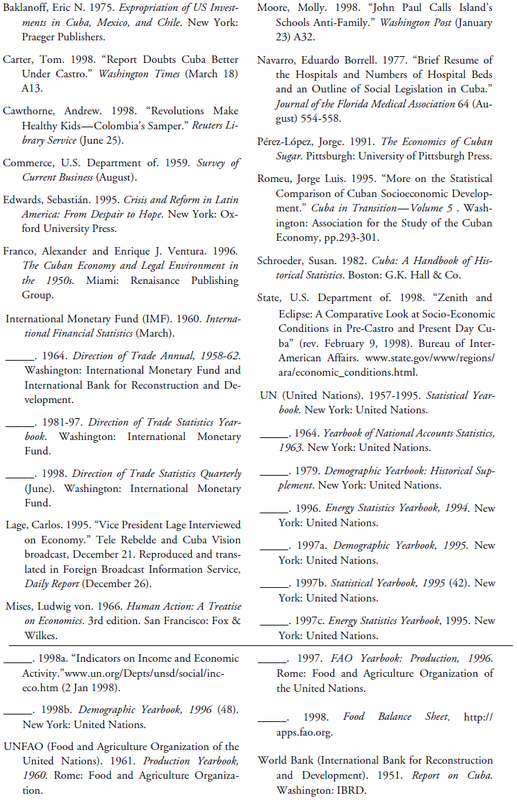 Franco and Ventura (1996) describe the wave of diverse American firms that launched operations in Cuba during the 1950s. Proctor & Gamble chose Cuba as the site of its first detergent plant in all of Latin America. In retail business, Sears Roebuck & Co., F.W. Woolworth, and others launched operations throughout the island. Also in the 1950s, Goodyear and Firestone Tire & Rubber made largescale investments, following on the success of B.F. Goodrich Co., which built the island’s first tube and tire factory in the 1940s. Finally, by the 1950s, Coca-Cola, which had previously imported inputs such as concentrate and bottles, was conducting nearly all of its manufacturing, processing, and bottling on the island. Today, figures on foreign investment in Cuba are obscured in government secrecy in an attempt to protect investors who may be trafficking in confiscated U.S. properties from possible U.S. government sanctions. Cuba has occasionally released data on the number of joint ventures contracted with foreign enterprises, but statistics on the value of these investments are hard to find. One official claimed in December 1995 that Cuba had received about $1 billion in paid-in foreign investment (Lage 1995), but the statement was not clear as to whether this figure represented a stock value or a flow value, and if the latter, for what period. Reliable intertemporal or intercountry comparisons, therefore, are not possible at this time. As the numbers above imply, Cuba had a very favorable overall balance of payments situation during the 1950s, contrasted with the tenuous situation today. In 1958, Cuba had gold and foreign exchange reserves—a key measure of a healthy balance of payments—totaling $387 million in 1958 dollars, according to IMF statistics (1960, p. 90). (That level of reserves would be worth more than $1.9 billion in today’s dollars.) Cuba’s reserves were third in Latin America, just ahead of Mexico and behind only Venezuela and Brazil, which was impressive for a small economy with a population of fewer than 7 million people. Unfortunately, Cuba no longer publishes information on its foreign exchange and gold reserves. However, we suspect that if Cuba had $1.9 billion in reserves today, its much-publicized balance-of-payments problems would be solved. We suspect that similar comments could be made about the number of radio and television broadcasting stations, although the UN no longer reports these statistics. However, it should be noted that in 1957, Cuba had more television stations (23) than any other country in Latin America, easily outdistancing larger countries such as Mexico (12 television stations) and Venezuela (10) (UN 1960, p. 610). Cuba also was the first Latin American country to broadcast television programs in color (Franco and Ventura 1996, p. 14). It also led Latin America and ranked eighth in the world in number of radio stations (160), ahead of such countries as Austria (83 radio stations), United Kingdom (62), and France (50), according to the UN Statistical Yearbook (1960, p. 607). Not long after the previous version of this paper was published (State 1998), the Washington Times quoted the Cuban Interests Section’s objections to the statistical presentation found in the study (Carter 1998). It did not dispute the statistics themselves, the majority of which are reported by the Cuban government itself to multilateral institutions discussed earlier. Rather, a spokesman asserted that the statistics did not take into account the social achievements of the revolution in relation to the distribution of wealth. For example, he said, “[B]efore the revolution, the rich had more food and the poor had less.” This statement is, of course, indisputable, but it leaves unanswered how a society in which virtually everyone is poor is preferable to one in which some people are poor, others are middle class, and still others are rich. The Marxians used to recommend socialism on the ground that it would multiply productivity and bring unprecedented material wealth to everybody. Only lately have they changed their tactics. They declare that the Russian worker is happier than the American worker in spite of the fact that his standard of living is much lower; the knowledge that he lives under a fair social system compensates by far for all his material hardships (1966, p. 679n). Mises goes on to note that “this haughty indifference with regard to material well-being is a privilege reserved to ivory-tower intellectuals, secluded from reality…” Most Cubans, if given the choice, would prefer the opportunity at a better life under capitalism over the “fairness” in poverty guaranteed by the Castro government. Perhaps that is why Fidel Castro steadfastly refuses to hold fair and free democratic elections. He realizes that if he were to do so, he would lose, just as his Nicaraguan compañero Daniel Ortega was defeated in 1990 and again in 1996. Cuba today faces both a problem and an opportunity. Her problem is to reduce her dependence on sugar, not by producing less sugar but by developing additional enterprises. Her opportunity is that her present prosperity offers her the means to do so by further diversifying her economy. Ample, unused human and material resources are available in Cuba with which her people might increase the nation’s output, broaden its economic base and create a better standard of living for the population as a whole. Also, at the present time, Cuba has a financial potential of her own, which—if it can be effectively tapped—is adequate for her development. That such optimistic words would open a publication dedicated to a discussion of the socioeconomic problems in a country is striking. Today, by contrast, sound economic policies have been eschewed in favor of anti-U.S. diatribes, which government and party functionaries have repeated with sufficient frequency to divert the world’s attention from the degree to which their own actions are responsible for the material deprivation suffered by the Cuban people. That the government continues to show such indifference to the material poverty outlined in this study, steadfastly holding to a completely discredited economic model—and at the same time calling capitalism unsustainable!—constitutes the saddest chapter in the history of the once great Cuban nation. 1. A previous version of this paper was released by the State Department’s Bureau of Inter-American Affairs (State 1998). The present version has been revised and expanded and as such, reflects only the personal views of the authors. 2. For a study of the changes in Cuba’s socioeconomic indicators relative to Chile, Costa Rica, and Mexico during the period 1920- 1990, see Romeu (1995). 3. Uruguay’s 97-percent literacy rate ranked ahead of Argentina’s in 1995, but comparable data for the 1950s are not available. We already have noted that the literacy rates of several former Caribbean colonies also ranked ahead of Argentina’s in 1995. 4. Since 1988, the 10 Latin American countries for which the most recent UN data are available, grew by an average of 33 percent in this measure over the 7-year period ending in 1995. Growth was strongest in El Salvador, where the number of passenger cars per capita increased by 97 percent, and Costa Rica, where it rose 61 percent (UN 1997b; UN 1998b, pp.155-156). 5. U.N. estimates (1964, p. 328) based on purchasing power parity exchange rates (1964, p. 328) put Cuba in seventh place among 20 Latin American countries in 1958. Unfortunately, the U.N. no longer publishes this purchasing power parity exchange rate-based data series. 6. IMF trade statistics are issued on a more timely basis than those from the United Nations. When possible, we have used IMF trade statistics in this study. However, prior to 1993, IMF data for Cuba excluded Cuba’s trade with the former Soviet Union. This situation was remedied in 1993, when Russia, Cuba’s most important trade partner, began reporting to the IMF. For Cuba’s trade, we use UN statistics for the period 1975-1992 and IMF statistics for 1993-present. Despite the discontinuity, we believe that this usage provides the best picture of Cuba’s exports during this period. 7. Totalitarianism, rather than the economic depression of the 1990s, is to blame for the decline in daily newspapers in Cuba. Indeed, the number of dailies in Cuba in 1994 was unchanged from the number in 1980, according to UN statistics (1997b, p. 120).